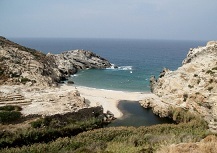 On this page we present stories about people, places and events from the history of Ikaria. An approximate Timeline of who ruled Ikaria through the centuries. The Picture featured is of Ancient Nas. Daedalos was the master-craftsman who built the Labyrinth for King Minos at his palace of Knossos on Crete to contain the Minotaur. Unfortunately Daedalos, by giving a ball of string to Minos' daughter, Ariadne who then helped his enemy Theseus to penetrate the Labyrinth and slay the Minotaur, incurred the wrath of Minos. Minos then imprisoned Daedalos and his son, Ikarus. Some say that he was imprisoned in the Labyrinth but on Crete they say it was in a cave at what is now the seaside resort of Agia Galini on the south coast of Crete. While incarcerated there Daedalos fashioned two pairs of wax wings for himself and his son, which they used to escape from captivity. It is well known that Ikarus, in spite of warnings from his father, was so excited by his ability to fly that he flew too near the sun, his wings melted and he fell into the sea and perished near Ikaria. 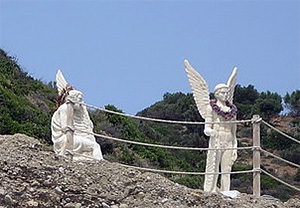 On the Eastern cliff above the harbour at Agia Galini you can see the cave where Ikarus and Daedalos were thought to be imprisoned and recently created statues of the unfortunate pair. Theoktisti was born on the Aegean island of Lesbos. This item links to a full story of Theoktisti, from her abduction from Lesbos by pirates in the ninth century AD to her interment on Ikaria. Photograph of the sailing ship Ayios Haralambos being built at Evidlos. Photograph dated 1925. The boat was 30 tons built for cargo and owned by Haralambos I Douris. The builder was Strati Flanouraki and made from pine cut and tranported from the Douris land at Yialiskari. 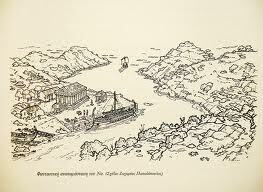 One of the men standing on the stern was the grandfather of Efthemios who today runs a kafenenion in Evdilos plateia. In due course, this item will link to a discussion about ship and shipbuilding on Ikaria in times gone by. 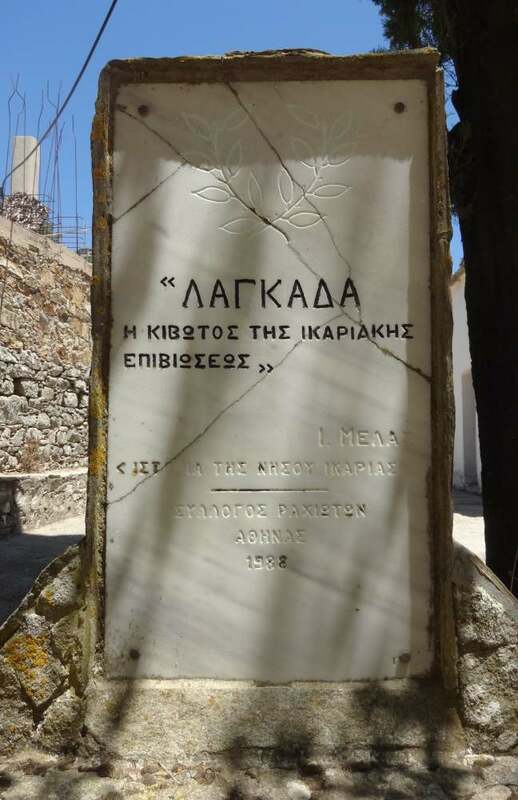 Langada - First Settlement on Ikaria? Some facts about Langada said to be the birthplace of the Ikarians. Inhabitants of Ikaria have lived in the area for 1000's of years and and it is the location of the biggest Panigiri on Ikaria on 15th August each year. 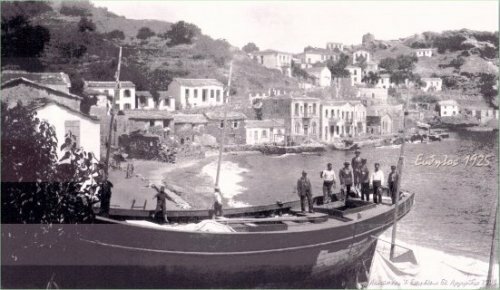 An Article containing some facts about Nas one of the oldest settlements on Ikaria. 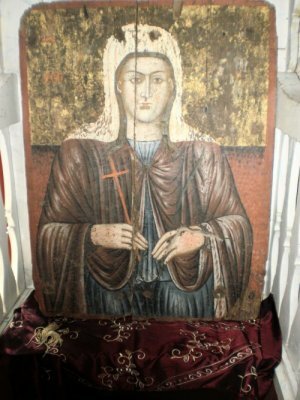 In the 1600's the Bishop Georgirenes of Samos visited Ikaria. By the 1670's he had fled to Great Britain and besides being responsible for the building of the first Greek Orthodox Church in London he also wrote a book about his visit to Ikaria and other places. This item links to his story. See also the item Georgirenes Book for the translation of his book. This is a transcript of the chapter on Ikaria by Archbishop Georgirenes written in 1677. He was Archbishop of Samos,Ikaria & Patmos but wrote his book while in the UK at the court of King Charles II. The book was written in Greek and translated. This is an article on Fani who lived on Ikaria to the ripe old age of 117. 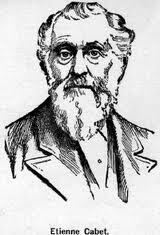 This a link to the story of a Frenchman, Etienne Cabet, who founded a Society promoting a communal way of living based upon the way Ikarians lived, in particular by helping each other. Some of the old photographs on this website were kindly provided by Christos Malachias, the photographer in Raches. We thank him for that.